The 2014 Peňafrancia Festival is held to celebrate the feast day honoring Our Lady of Peňafrancia in the month of September by the United Bicolandia of Los Angeles (UCBLA), the umbrella organization of Bicolanos from Southern California. Consul General Leo Herrera-Lim and Madame Fides Herrera-Lim graced the event together with officers and staff from the Philippine Consulate General. In his remarks, Consul General Herrera-Lim commended UBLA for organizing a successful festival, bringing together the Fil-Am community, and showcasing the Filipinos devotion to the Virgin Mary. The whole-day celebration, draws devotees and guests every year and has always been one of the biggest fluvial festivals and only one of its kind for Filipinos in Southern California. The Archbishop Emeritus Roger Cardinal Mahoney celebrated the mass at Lincoln Park. 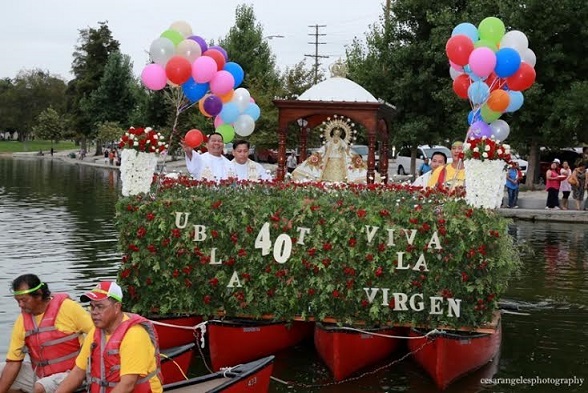 The highlight of the fiesta was a fluvial parade, featuring yellow-shirted “voyadores” carrying the image of the Virgin Mary aboard a floral barge towed by boats around the lake. The fluvial procession is accompanied by a foot procession along the perimeter of the lake. Uniformed Knights of Columbus provided the guard of honor.